The Whale Cove area was explored by Captain Thomas Button in 1613, and later by Captain Luke Foxe in 1631, in a search for the Northwest Passage. In the early 1700s, the Hudson’s Bay traders visited this area on a more or less regular basis to trade with the Inuit. 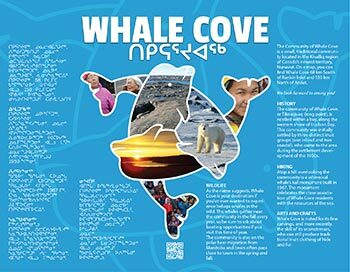 The community of Whale Cove dates from the 1950s, when inland based Caribou Inuit were moved here by the Canadian government to assist them in adapting their hunting skills to coastal resources. They were joined by other families from Rankin Inlet when the nickel mine there was closed.